Inside the JCP, Spec Leads struggle how to involve developers during the creation of the specification. How can you get people interested in testing, how can they understand the decisions, how can a normal developer give input in something that is still being created? 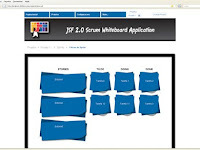 The ScrumToys project show a fun and collaborative way to involve developers in participating in a JSR. An open source project developed by a Brazilian team during the evolution of the JSR-314, the Java Server Faces specification, ScrumToys joined together several efforts around JSR-314: the specification itself being written in the JCP, the reference implementation written in the Glassfish project, and the effort in Netbeans to support the new features. The main goal of the project was to test and showcase all the JavaServer Faces 2.0 new features while the spec was being finalized. By becoming a playground of features while the specification was being written, the ScrumToys project allowed thousands of developers around the world to try and learn JSF without any effort to setup or run. And, they could easily send feedback on what worked and what didn't, so the JSR expert group could also see how people were using the new features. To make this collaboration possible, ScrumToys offered a complete, ready to run sample application distributed with NetBeans and Glassfish. With this setup, developers can simply select the ScrumToys application, and start experimenting the newest features of the JSR without any special setup. The ScrumToys is an early example of involvement of JUGs with the JCP, as it was developed by people extremely involved with JSR-314 but not formally part of JSF Expert Group. More recently, the project has become an important part of SouJava's Adopt a JSR initiative. With more developers interested in helping, ScrumToys is now being updated and expanded to cover JSR-344, by supporting the new features of JSF 2.2 for the Java EE 7. With that, we expect that ScrumToys will once again showcase an important Java specification, and make it very easy for thousands of developers to learn, experiment and contribute back to make the future Java.